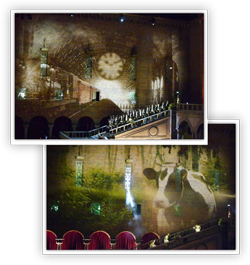 Transforming the deep red brick walls of Stockholm's City Hall into mind blowing visuals with Panasonic PT-DZ21K large venue projector. The entire hall was dark and quiet. Only a few candles lit up the darkness. All of a sudden, a shooting star appeared and flew above the heads of the astounded audience. As the music slowly began to play, snow started falling from the ceiling in The City Hall of Stockholm - or so it seemed. A silent sigh scattered amongst the audience as the opera trio Divine started to sing the opera version of ABBA’s famous song “I have a dream”. 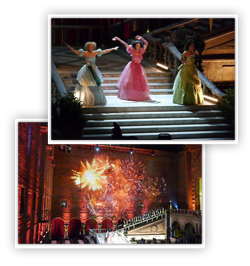 It is no exaggeration to say that the guest of the Nobel Banquet anno 2013 had an extraordinary experience at the dinner, when Divine’s performance was accompanied by magnificent visual effects projected directly on the deep red wall in The City Hall of Stockholm by six Panasonic PT-DZ21K projectors. The wall of the iconic hall was changed beyond recognition. The Nobel Banquet follows the Nobel Prize Award show and is attended by almost 1300 guests, including the Royal Swedish Family. The Nobel Banquet receives worldwide media coverage and it is a prestigious privilege to perform at this international event. When Divine was invited to perform at the event, they knew they had to assemble a team of experts to create a stunning performance. “Can you create a visual effect that complements our audio performance and helps intensify the feeling of traveling through time and space?” Largely, this was the demands provided by Divine, the opera trio that was scheduled to perform at the Nobel Banquet 2013 at Blå Hallen in The City Hall of Stockholm. Together a team of Visual Relief, Informationsteknik and Panasonic created a multimedia experience combining 3D video contents with surround sound to accompany Divine’s live performance. “We couldn’t have done this kind of show without the great teamwork of Panasonic, Visual Relief and Informationsteknik. The partners made the impossible become possible when they turned the red brick wall into imaginative visuals,” says Soprano Jacqueline Miura from Divine. The technique used for the event is called video mapping. A special projection technology used to turn irregular objects, like the brick wall, into a display surface for video projection. Panasonic delivered the specific projectors and software for the purpose, while Visual Relief created the visuals and Informationsteknik was in charge of the practical installation. “Our vision was to create something that had never been done before. We wanted to make a large-scale video mapping in Blå Hallen, that both the Nobel Banquet guests and TV viewers around the globe could experience,” states Video Scenographer Johannes Ferm Winkler from Visual Relief. To make this vision come true, there was a need for a projector that fulfilled demands for both strength and size. The projectors had to be small, though strong enough to provide sufficient light onto the dark brick wall to make it work with television broadcasting. It was a challenging project with several barriers to overcome. Due to the unusual space setting in the hall, the projectors had to be placed 15 meters apart, which is quite much for a projection distance of 41 meters. This made it difficult to make one synchronous projection without displacements. Another challenge was the projection canvas – the almost 100-year-old brick wall was not straight at all. At that moment, it seemed this project was nearly too impossible to implement. “It would have been difficult to make this performance without the PT-DZ21K projectors from Panasonic. They are small and easy to fit in most places. Even though they are small, they are very powerful and almost noiseless. All of these features were needed to create the video mapping performance. However, the essential key feature for this project was the special Panasonic projector software called Geometry Manager Pro. This software enables avoiding displacements in the projected picture and it is easy to set up and use,” says Project Manager Per Hellquist from Informationsteknik. The performance was a dream come true for Divine, as the visuals intensified the feeling of traveling through time and space during their performance. The audience of the Nobel Banquet and the TV viewers around the globe had a never-seen-before experience when Blå Hallen of Stockholm’s City Hall was changed beyond recognition. “The strength and extremely low sound values of the venue projectors was exactly what we needed to create this extraordinary show for the audience,” concludes Soprano Jacqueline Miura from Divine. The Nobel Banquet of 2013 took place on December 9 in the surroundings of Blå Hallen in the City Hall of Stockholm. The building is well known for its impressive architecture and its deep red colored raw brick walls. The building was designed by the Swedish architect Ragnar Ôstbeg and opened to public in 1923. With a few exceptions, the Nobel Banquet has taken place at the City Hall since 1930. Panasonic’s flagship PT-DZ21K projector series offers breathtakingly beautiful images, easy maintenance, and reliable operation. The projector has 20,000 lumens of brightness, and hosts avariety of rich creative capabilities. It is packed into an extraordinarily compact body; with every feature designed and developed to meet the projection needs of highly critical professionals across the full spectrum of applications. The Geometry Manager Pro software is included in the optional upgrade kit ET-UK20 for the PT-DZ21K projector. Geometry Manager Pro supports Colour Matching, Edge Blending, Uniformity Correction, and other useful functions for multi-projector setups (max. 32 units). It also allows creative masking using four lines or bitmap data. In addition, its flexible and complex geometric adjustment capability suits a wide variety of screen shapes.